Fashionistas: Try to remain calm. We know it’s not easy with Paris Fashion Week 2019 (otherwise known as #PFW or #PFW19) just weeks away. All those clothes, all those designers (Lagerfeld, Dior, Vuitton, Valentino, Chanel, Guo Pei, Schiaparelli, the list goes on). It’s enough to make a person crazy. Just remember, though, when the catwalk is over, and the lights go down, you’ll need someplace to spend the night and of course, sit down and post all those incredible Instagram photos. 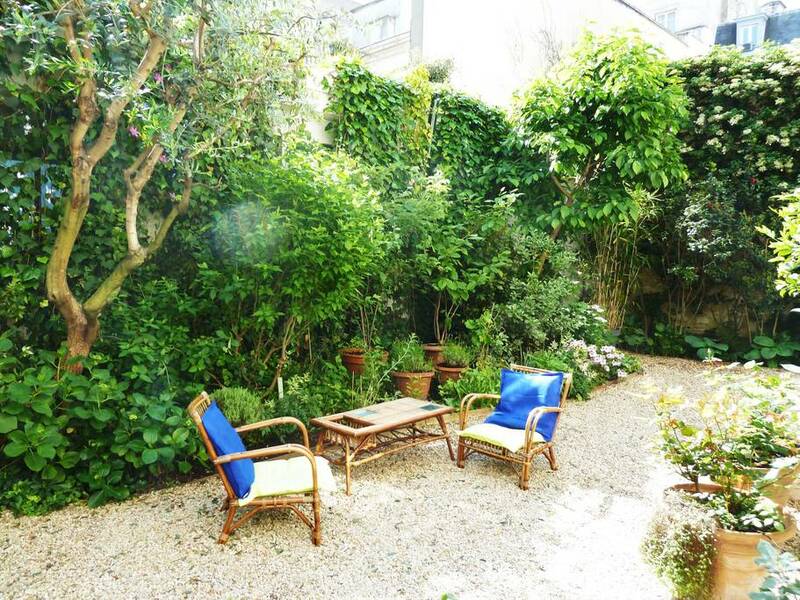 Here are some of our favorite Paris Airbnb homes for Paris Fashion Week. 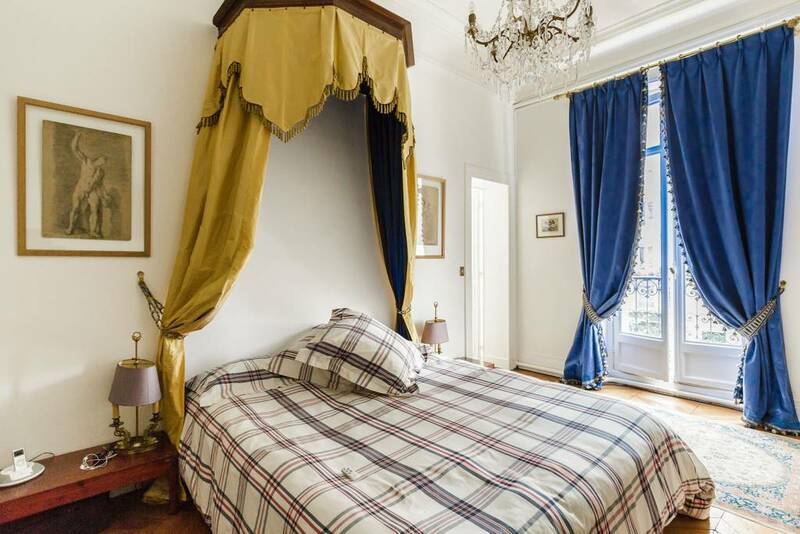 OMG, you are going to look SO GOOD coming out of this Paris Airbnb!!! First of all, you will be right near the Champs-Elysées, which means you’ll be near Avenue Montaigne, one of the most elegant shopping streets in the world, let alone Paris. Think Fendi, Louis Vuitton, Dior, Chanel, Valentino, and even Ralph Lauren. 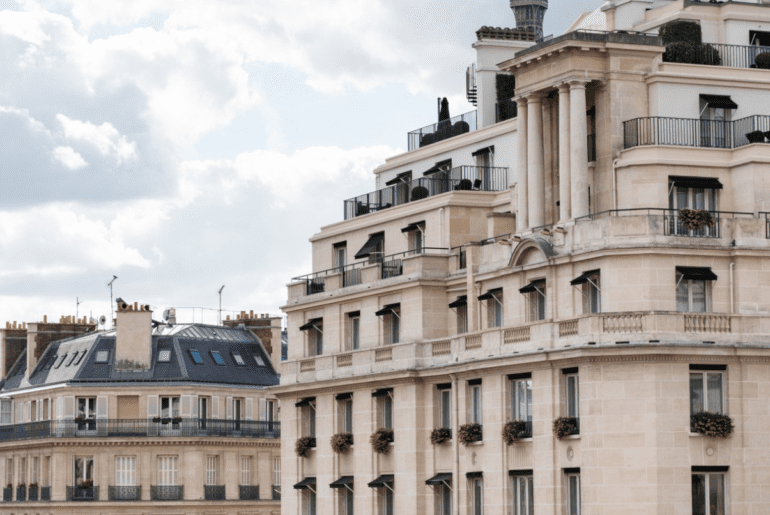 Not to mention the fact that you’ll be near great shopping on the Champs-Elysées itself (think Ungaro, Fendi, and even the best French macaron place on the planet, Ladurée!). 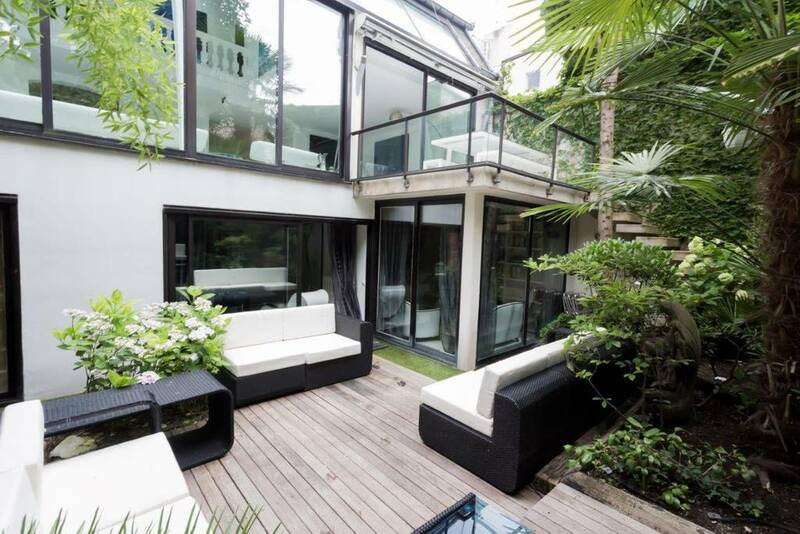 This Paris Airbnb sleeps six within its two bedrooms so why not ask some fashionista friends to join you for PFW? 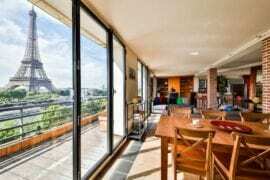 There’s even a terrace from which you can see just the tippy tippy top of the Eiffel Tower! 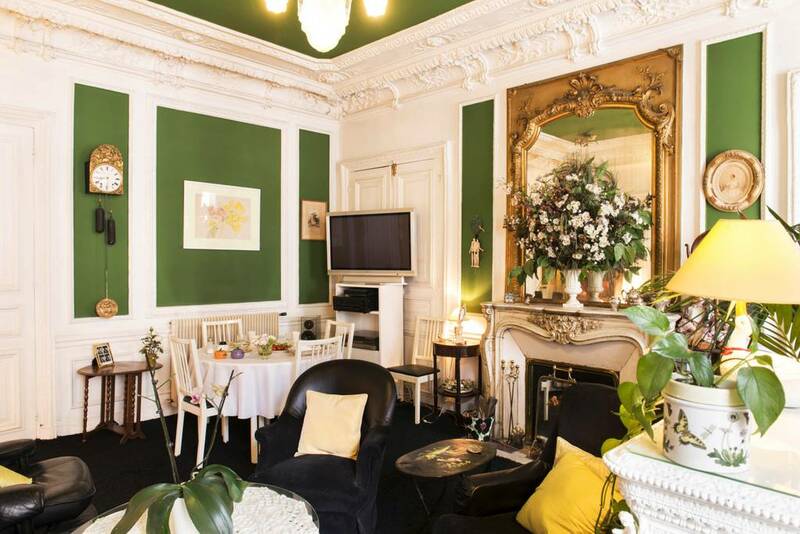 Want a fun, happy, charming little place to reflect your personality and make you feel as if spring has already sprung? 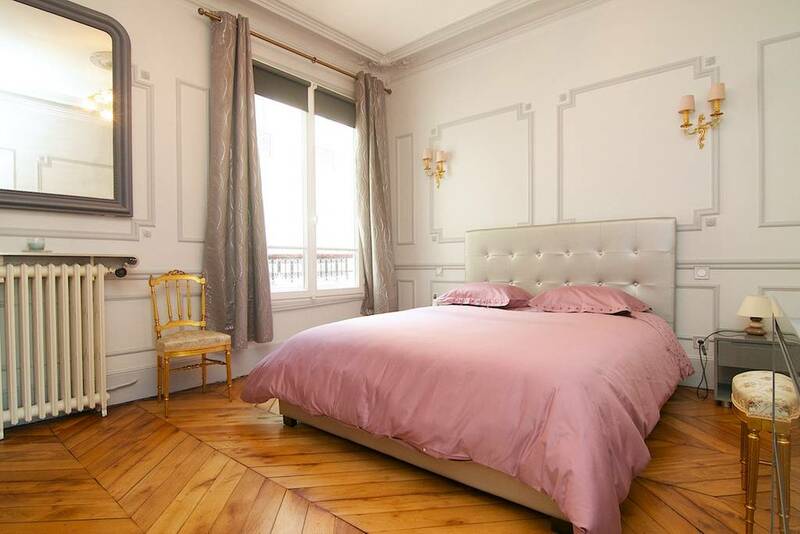 This totes adorbs Paris apartment will have you singing “La Vie En Rose” in no time! 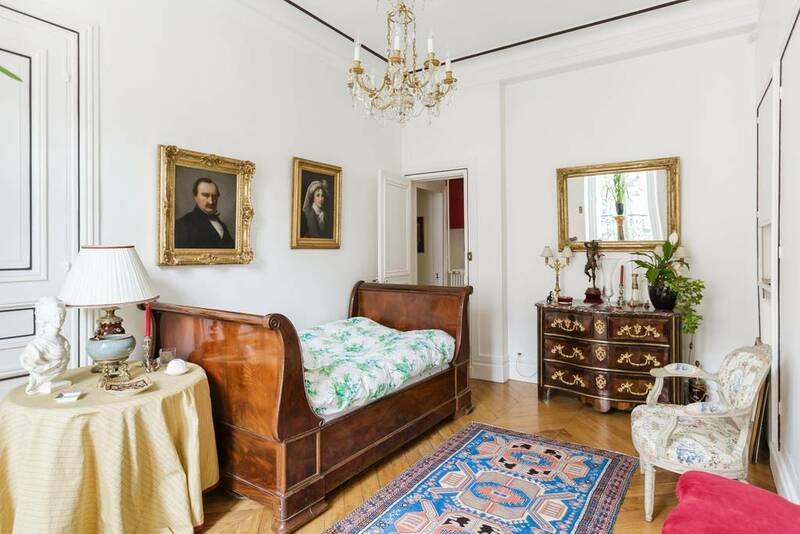 This private room is part of an apartment owned by a French-American family so if you’re a little iffy about your French, this is a perfect choice. 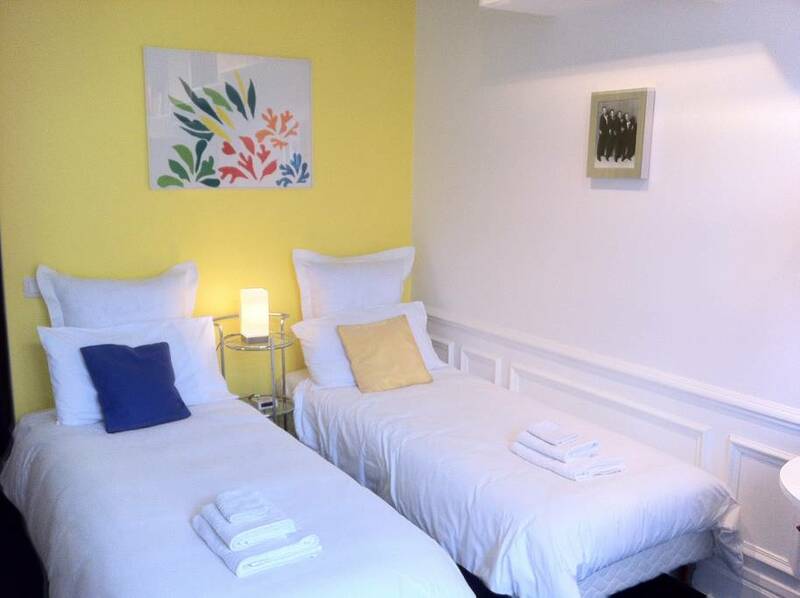 With a queen-sized bed that can be made into two single beds, satellite TV with international channels, wifi, and a French breakfast included in the price, this is the perfect place to stay for a newbie fashion influencer without a ton of money to spend. You can even drop off your luggage here before check-in time which is relatively unusual for a Paris Airbnb as well as a huge advantage when you have to run off to a bunch of fashion shows. 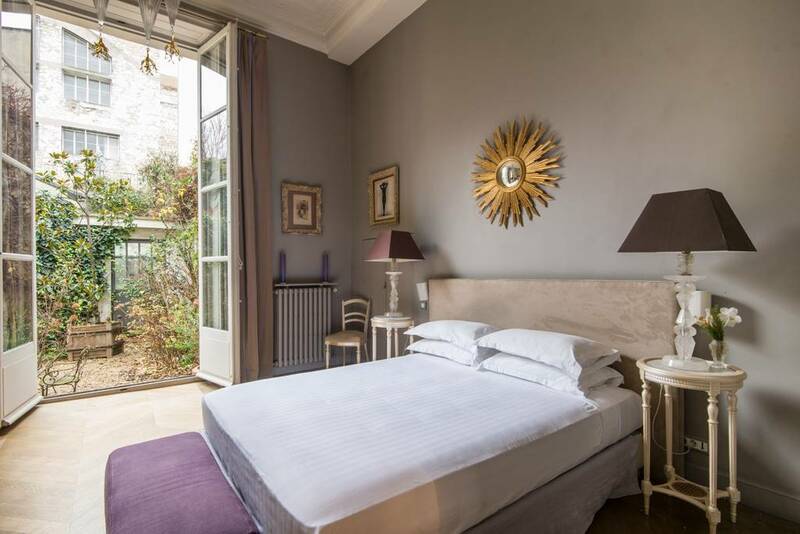 Speaking of that, you’ll be within walking distance to the Grand Palais and the Carrousel du Louvre where many major fashion houses show every year. And at $114, this place is a huge bargain! There’s a lot to unpack here but can we just start with that floor-to-ceiling window? And how much fun is that bubble chair? And the artwork—how cool is that art work? 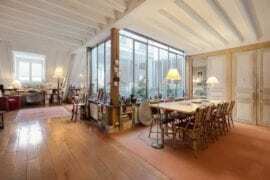 Just the place for a creative spirit to have a great Paris Fashion Week! 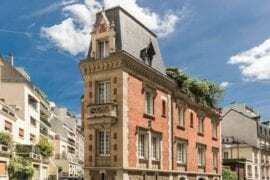 And the perhaps the greatest part of this is that it’s located in the 14th arrondissement in a charming section of Paris known as “Villa D’Alésia” which used to be where many famous artists (including Matisse!) used to have studios. It’s relatively unknown and set back from all the bustling streets so you’ll have peace and quiet after a long, chaotic day going from runway to runway. 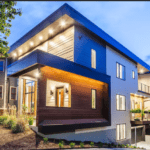 With four bedrooms and four and a half baths, it’s the perfect place to rent with a couple of fashion-minded friends (there are some great street markets nearby and a Japanese garden in the back where you can have BBQs!). 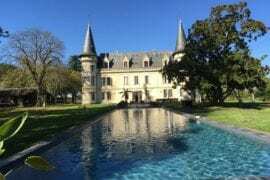 And keep this in mind: this place is ten minutes away from Orly airport so you can be at the airport faster than you can say “couture”! 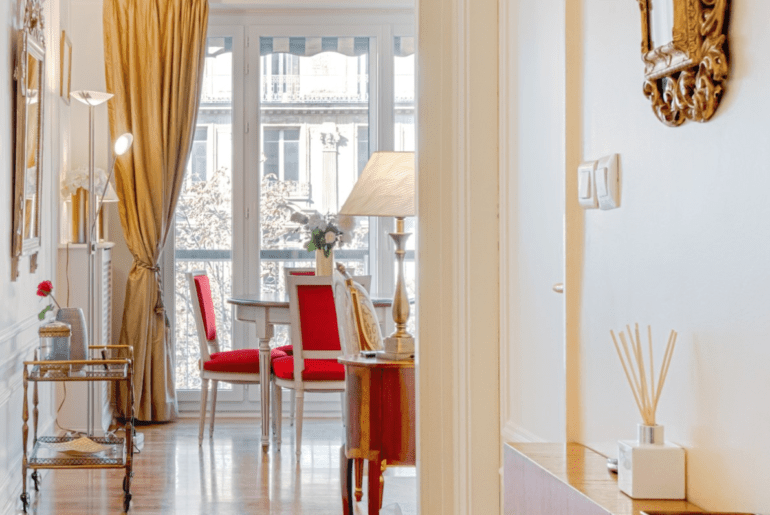 Break open the Veuve Clicquot because this apartment is something to celebrate! 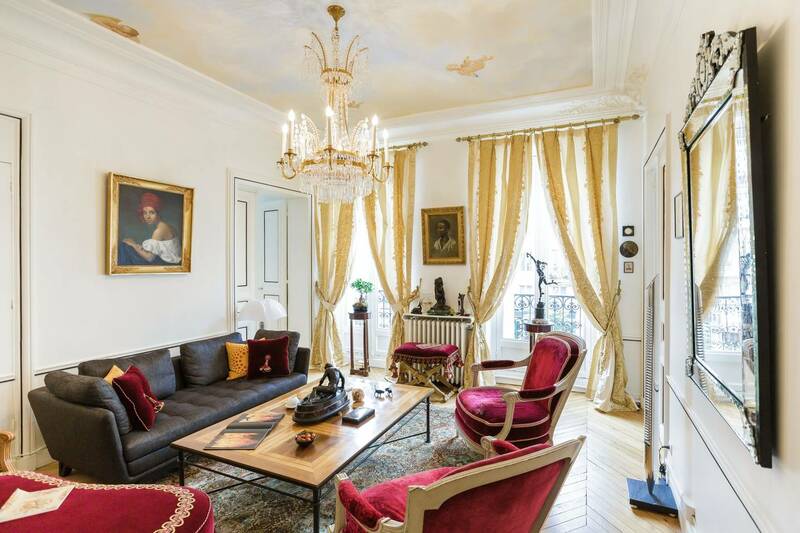 One of those “Only in Paris!” apartments this incredible, one-of-a-kind Latin Quarter apartment is so full of things to look at you may not even bother hitting the fashion shows. 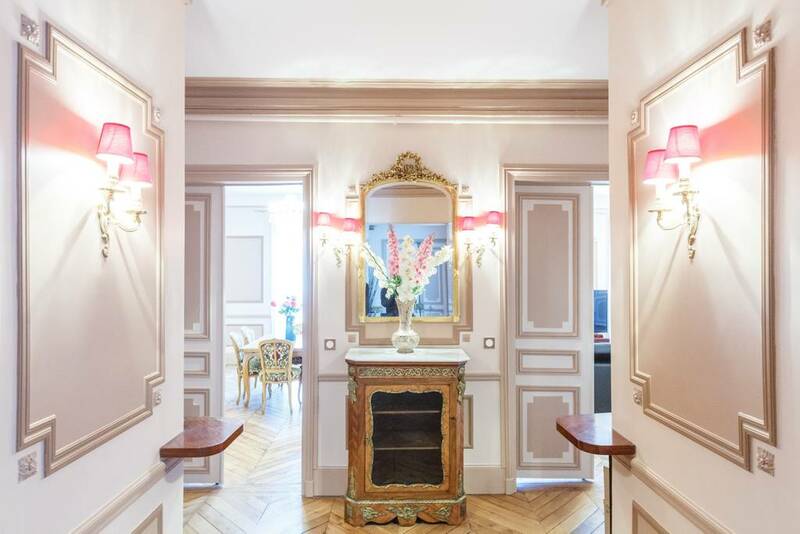 This five-bedroom, two and a half bath Airbnb duplex has an amazing seven beds and sleeps 12 guests (although it’s only available on Saturday nights and French school holidays so plan accordingly). 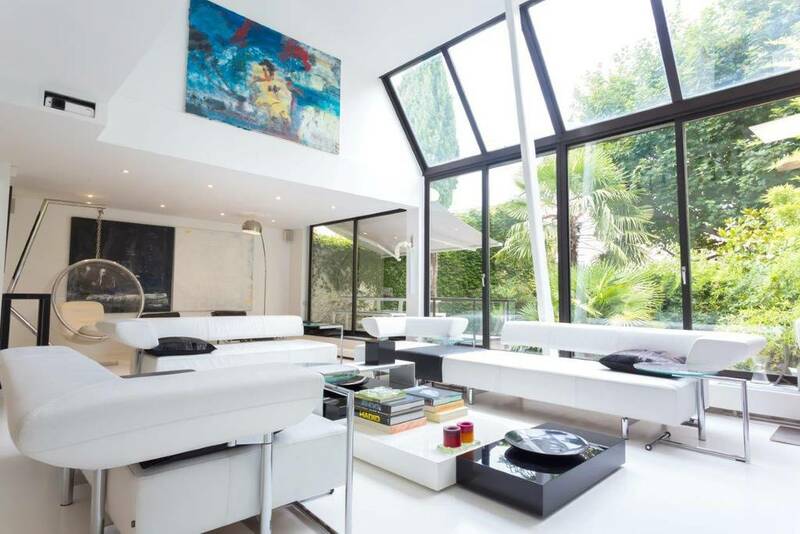 With a fully equipped kitchen, computer, TV, concert piano, bicycles and scooter, it has loads of things to keep you busy once the fashion shows are over. In addition to the amazing art work hanging on the walls, there are incredible murals painted directly on them! Situated in the famous Latin Quarter, this place is just a short walk away from the rue Monge market, rue Mouffetard which has dozens and dozens of restaurants, shops, bars, and even a bowling alley, and, the Musée des Arts Décoratifs which, for any fashion/art/design fan is worth checking out for just the gift shop alone! At $400 a night, this is also one of the best bargains you’ll find in this notoriously expensive city! 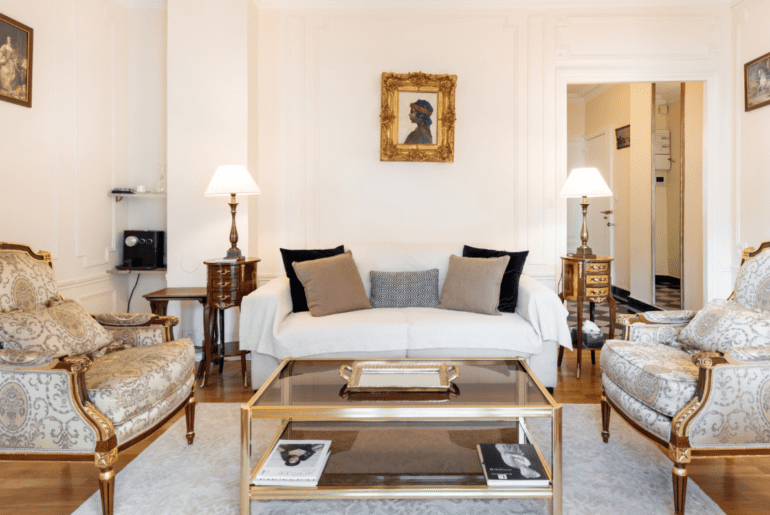 Classic with just a bit of whimsy is how we’d classify this refined, but modern looking space, making it a perfect mix for influencers attending Paris Fashion Week. 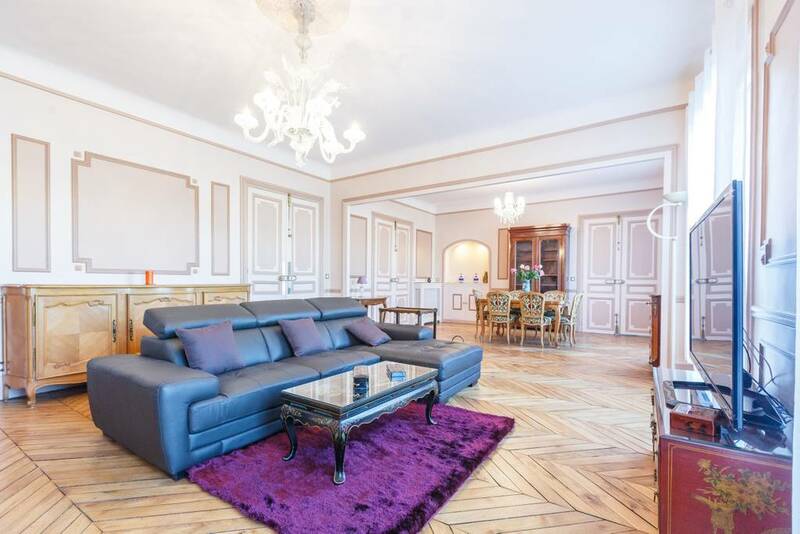 This elegant apartment which sleeps seven within its three bedrooms and three and a half bathrooms is located in the Louvre-Opéra area making it a shopper’s dream come true. 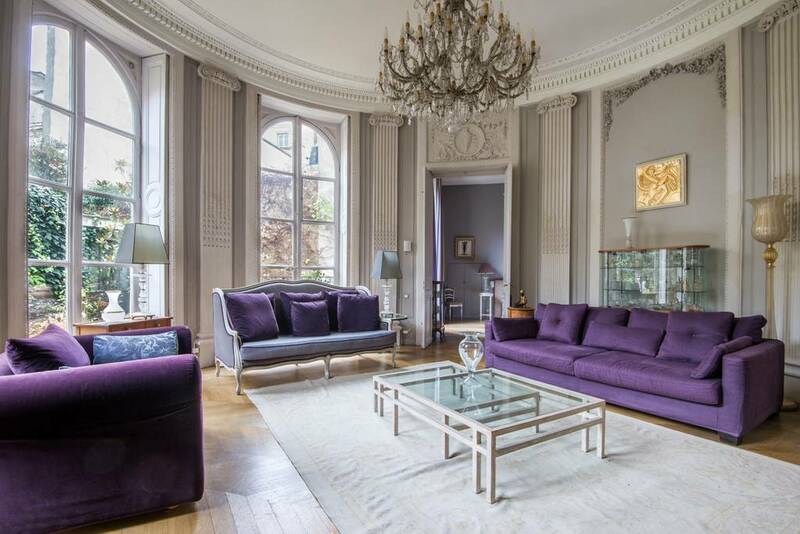 The fun, purple furnishings, blue rooms, rotunda ceiling, zebra rug, and bedroom that opens out on to the beautiful terrace will make your Paris Fashion Week Instagram posts the envy of every influencer in town. 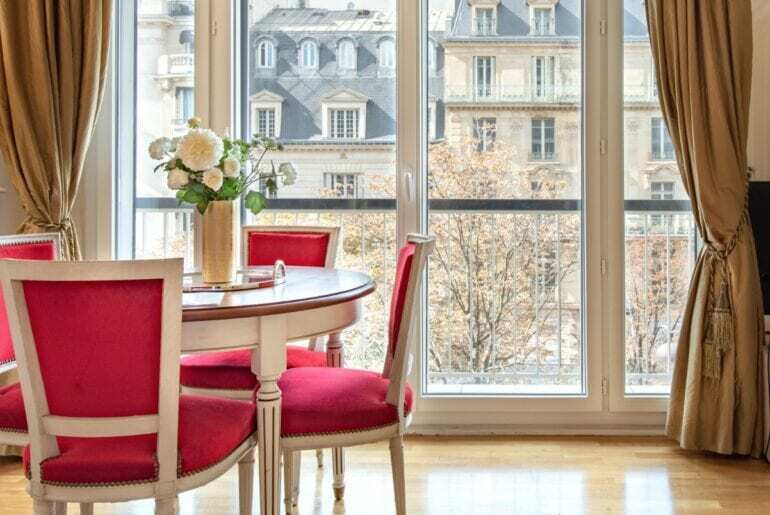 You’ll be within walking distance of the rue du Faubourg Saint-Honoré, arguably one of the city’s world’s best shopping street. 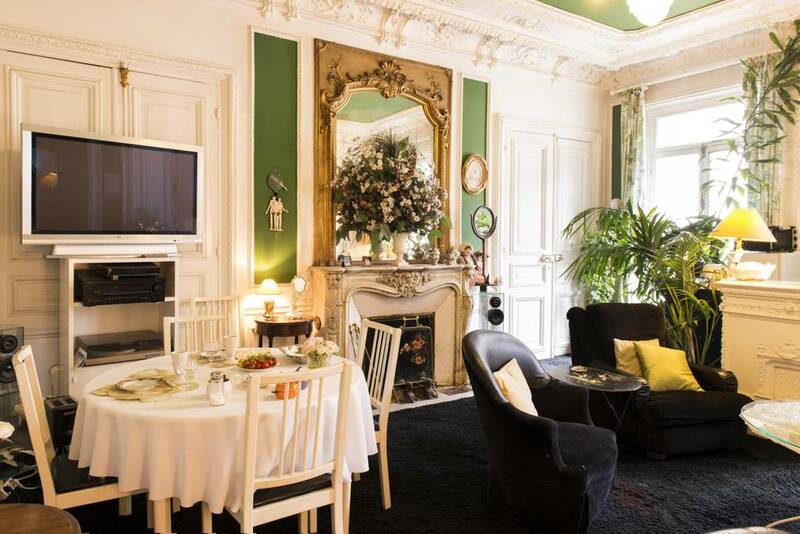 Famed Astier de Villatte which carries some of the most beautiful hand-crafted pottery you’ve ever seen, clothier Zadig & Voltaire, YSL, Lanvin, Gucci, La Perla, and perhaps France’s most famous maroquinerie (leather goods store), Hermès. 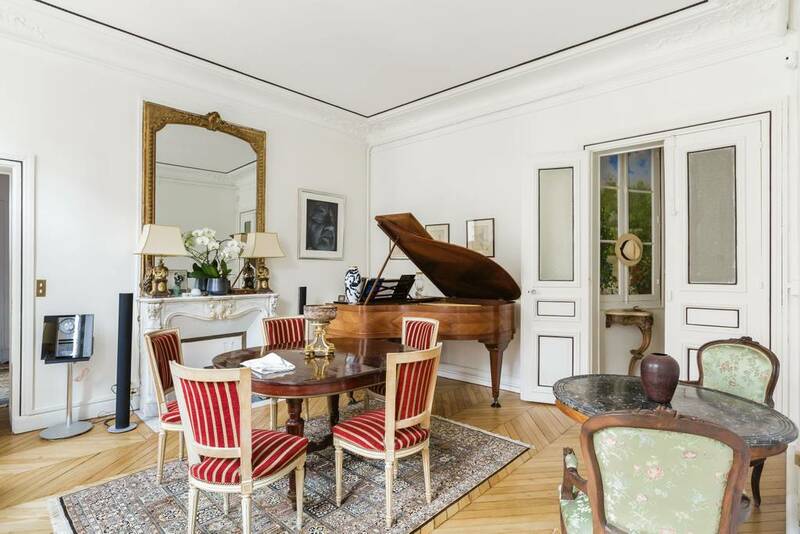 Coco Chanel herself couldn’t have designed a better apartment. 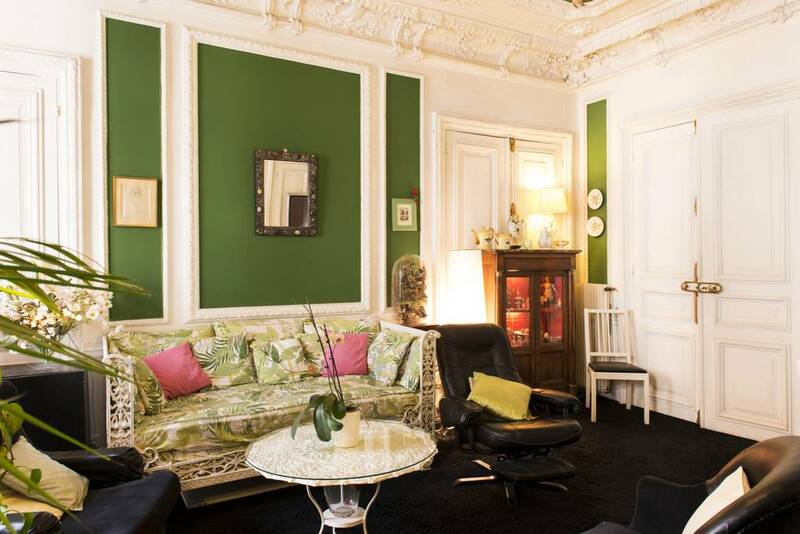 Eclectic, fun, elegant, and wonderfully French, this Place République apartment is perfect for any stylish fashion fan. 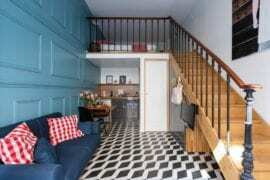 Located in a secure building with an elevator, this two-bedroom, two bath apartment sleeps four and gets insanely good reviews on Airbnb. Very, very close to the super-hip Canal St. Martin, it’s right near great fashion shopping like the popular colorful Antoine et Lili line. 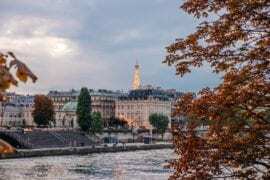 You’ll also be right near the Bastille area so if you’re into Paris street fashion you’ll have an endless supply of people to watch (take a seat at La Bastille café, order a vanilla chaud and sit for hours just people watching). 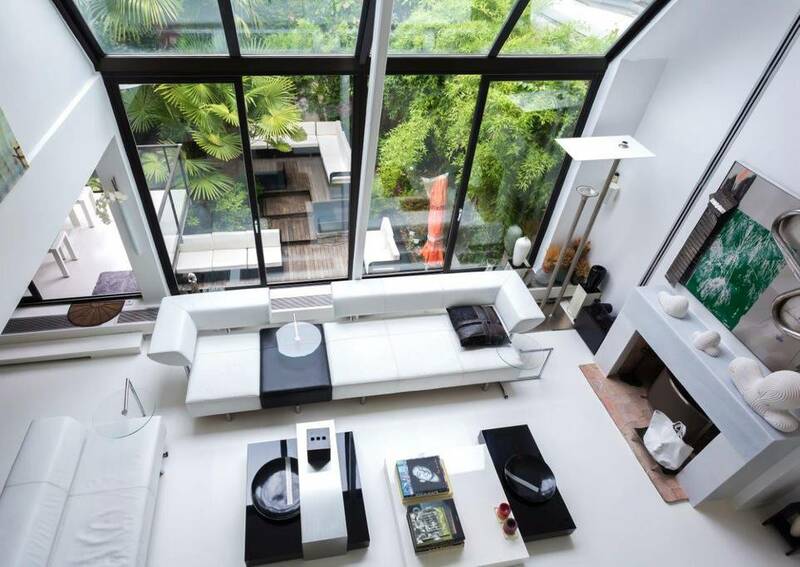 Once the fashion shows are over, this is a great apartment in which to just chill. 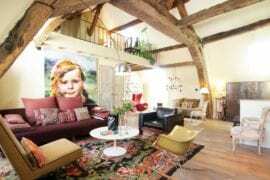 There’s a ton of interesting art to look at, a TV, a piano, books, tons of antiques, and murals of cherubs on the ceiling that are so amazing it makes us wonder how many guests have gone home and painted angels on their own ceilings. 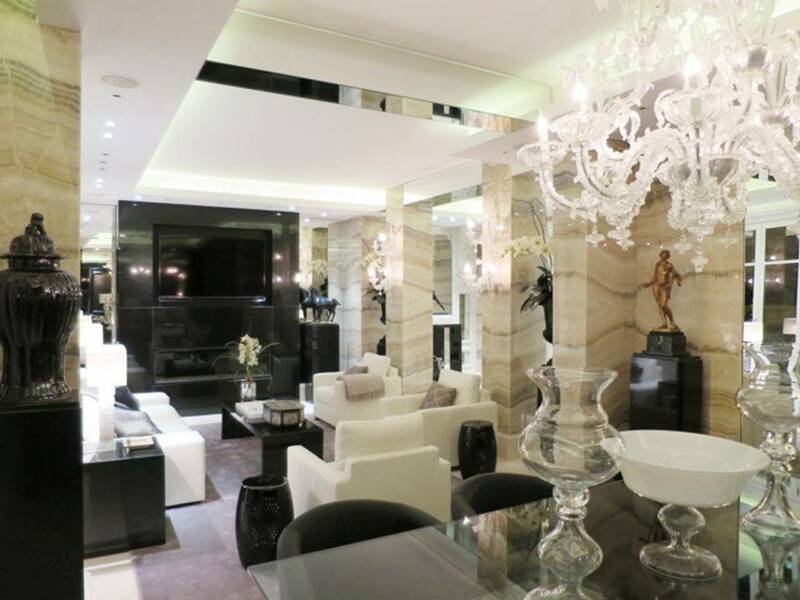 If ever there were a perfect place to get ready for the fashion shows of Paris fashion week, it’s here! 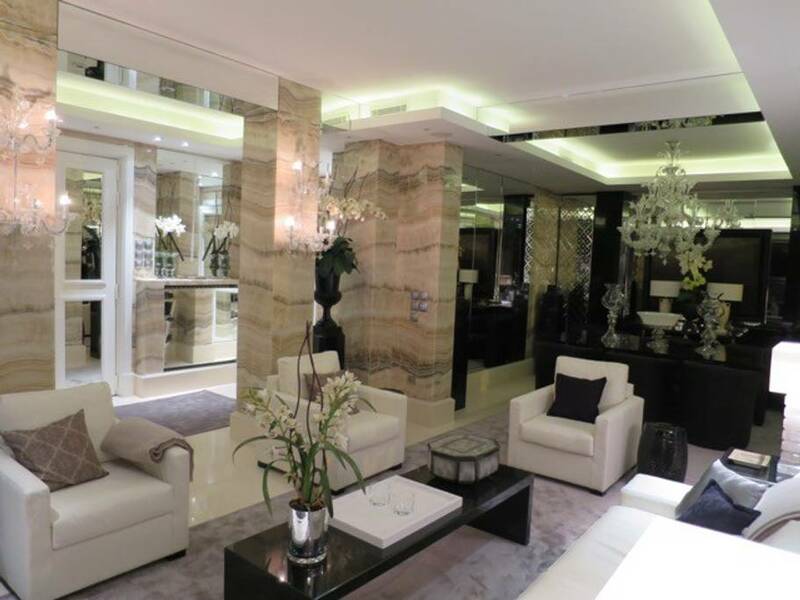 This Haussmann building is at the intersection of avenue Georges V and the Champs-Elysée which is pretty much the swankiest crossroads you could ever imagine. Located on the second floor of an elevator building, this breathtaking stunner will have Valentino himself asking if he can stay the night. 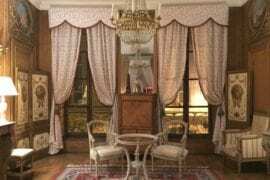 Decorated just about top to bottom in rare marble, onyx, and endless mirrors, this place is Ritzier than the Ritz itself Outfitted with “tapestries, bronzes, and period furniture,” not to mention a Murano glass chandelier, you might think you’re in Versailles. 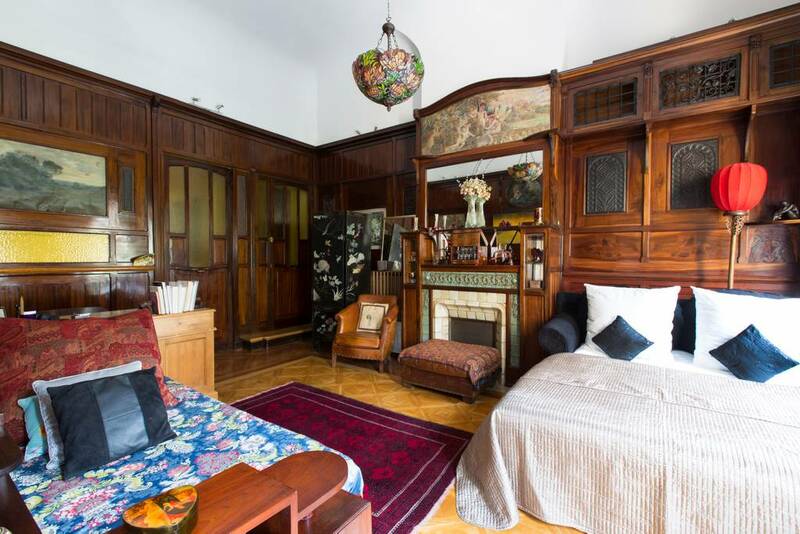 Right in the center of town, this crazy elegant apartment received a 100% five-star rating on Airbnb, all but ensuring you’ll have a perfect time. 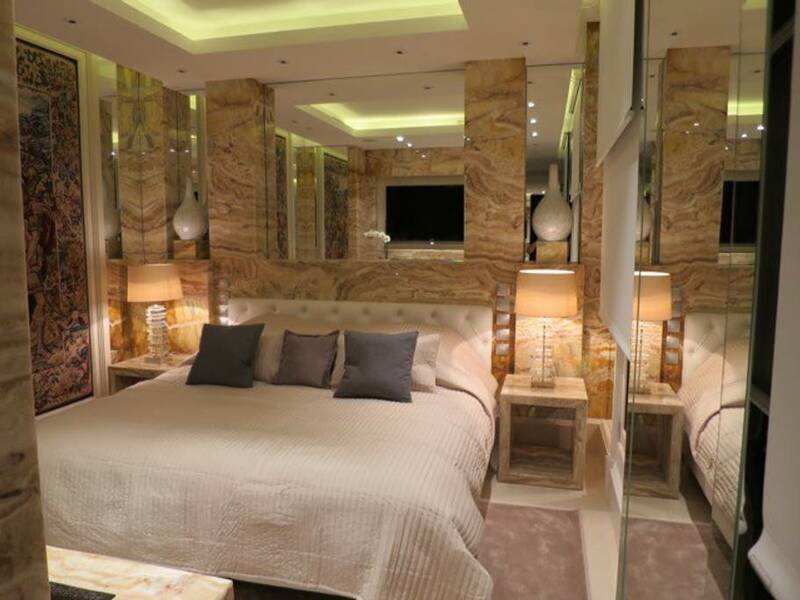 OK, tell us you don’t dream about waking up in that bedroom? 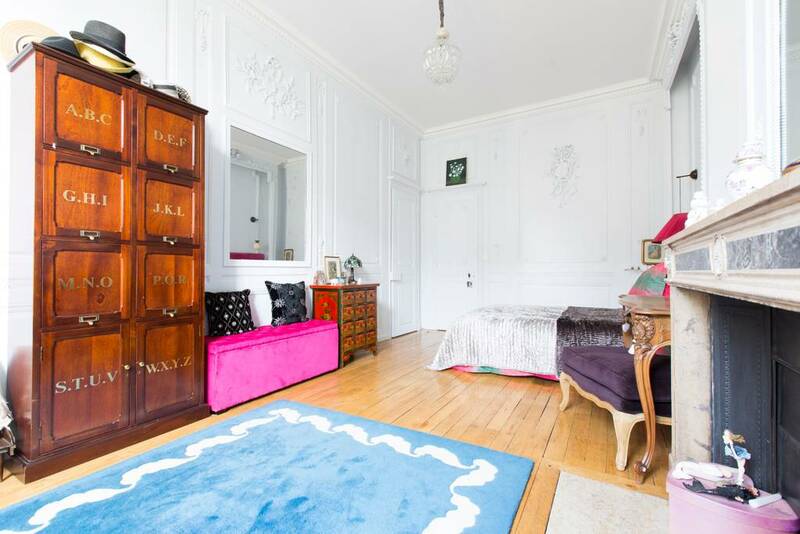 Located in the 8th arrondissement, this three-bedroom, two-and-a half-bathroom apartment done in Ladurée macaron colors is like a Paris fantasy apartment come to life, especially for someone attending Paris Fashion Week (it even has one of those gold chairs they use for the audience!). 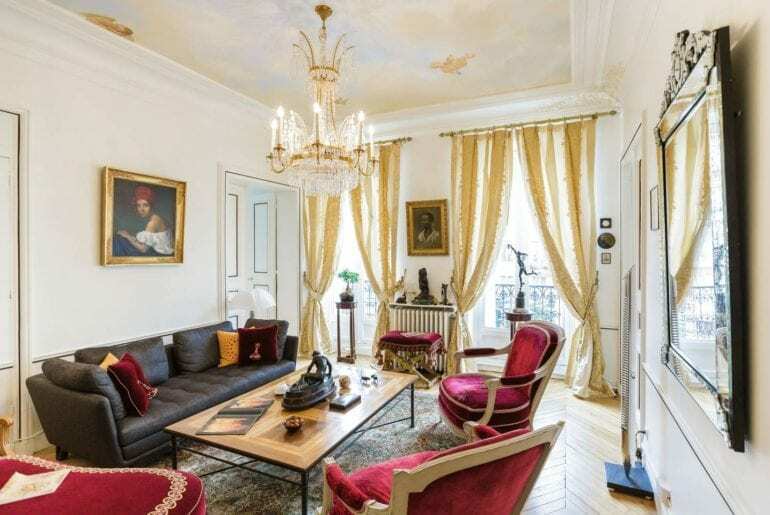 With a 65-inch satellite TV, fast Internet, a new washing machine and clothes dryer, modern bathroom with a double vanity, and elevator and concierge, this 8th arrondissement apartment will put you right in the middle of everything including: the rue du Faubourg Saint-Honoré, the Opéra Garnier, the Place de la Madeline, and just about all the department stores (or grands magasins as they’re called here). 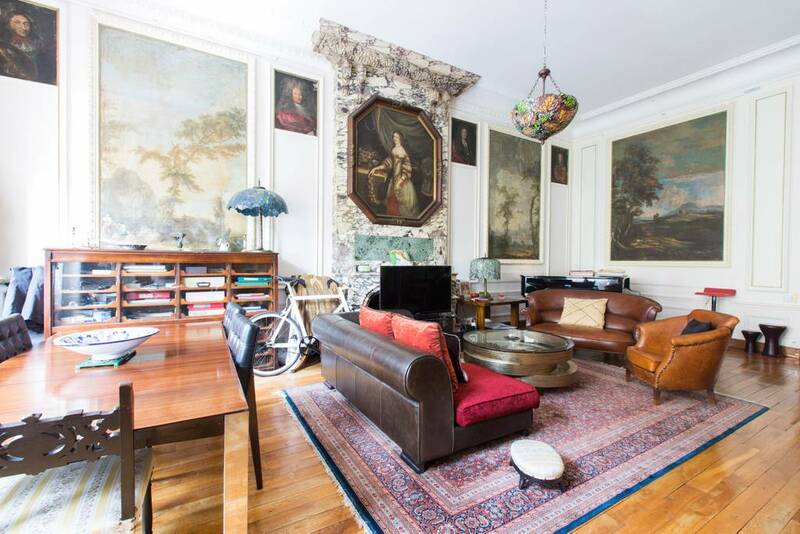 Located on rue de Rome, a street known for carrying all kinds of musical instruments, this apartment comes complete with a basket full of fruit and wine to kick off Paris Fashion Week with a little style!